Discover the new 40 Years Anniversary Edition! Despite her blue water credentials, the Xc 38 still provides the performance, response and exhilaration under sail that X-Yacht Owners have come to expect from any X-Yacht. In 2017 Cindy and Peggy bought their new Xc 38. The cockpit table with central storage and handrail with drink holders. Stainless steel self-tailing Andersen Winches are part of Xc 38´s comprehensive standard quality. The cockpit table with central storage and handrail with drink holders. Optional chart plotter and autopilot control can be fitted into the aft end of the table. Stainless steel self-tailing Andersen Winches, which can be upgraded to be electrical powered are part of Xc 38´s comprehensive standard quality. Quarter sawn high quality wooden veneers, lightly sanded and varnished, from Italian suppliers. As standard furniture is built in Nordic Oak offering a light modern look. More traditional teak is also available. Below samples have a hard wearing top surface of laminate imitating wooden veneers. As an alternative, top surface of genuine wooden veneer (as Bulkhead & Furniture) is also available. The worktop is made of an advanced composite of natural minerals and pure acrylic polymer which creates a stone-hard, luxurious surface. Alsace and Nubilux; Extremely easily cleaned. 100% Polyester Microfiber Fabrics has knitted back and velor surface. Microfiber is breathable, durable and abrasion resistant. 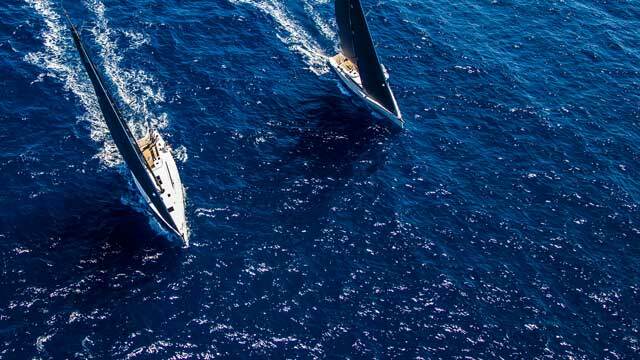 Established in 1979, X-Yachts was created primarily to design and build IOR yachts for world class racing... Two decades later it decided to utilise its expertise to build high quality performance cruising yachts as well. De X-yachten worden traditioneel opgetrokken rondom een stalen frame dat de boten erg sterk maakt. De kiel wordt er aan bevestigd en om de krachten van de tuigage goed over de hele romp te spreiden wordt gewerkt met een doorgestoken mast die op het frame en dus de kiel steunt.